A kilocalorie (kcal) is the total amount of energy that is required in order to raise the temperature of one kilogram of water by 1 degree Celsius at one atmosphere of pressure. The kilocalorie is still used in chemistry. For example, it is used to indicate the amount of energy that is released in a reaction of 1 mole of a reagent. The metric equivalent of the kilocalorie is the kilojoule. There are 4.184 kilojoules (kj) in 1 kilocalorie. The kilocalorie is what is recorded and placed on food labels as a measure of the energy content of a particular type of food. However on food labels it is often written as Calories (calories written with an uppercase C). These Calories are not the same as scientific calories but are actually kilocalories, which is why they are written with an uppercase C.
The convention that is used for recording kilocalories on food labels is therefore to use an upper case on the word calories, so remember that when you see Calories it actually refers to kilocalories. Some countries do however, record kilojoules instead of Calories on their food labels. Kilocalories in the past were calculated by using a bomb calorimeter in which the food was completely burnt, allowing for an indirect estimate based on how much the temperature of water was raised as a result of the heat generated by the burning. Today they use the Atwater system which is based on the energy of individual components of carbohydrates, lipids and proteins which make up food items. This is based on the knowledge that fats (lipids) have about nine Calories per gram, while carbohydrates and proteins have about four Calories per gram in each case. A kilocalorie is equal to 1000 calories. This means that to calculate how many calories you have based on kilocalories you simply multiply by 1000. For example 6 kilocalories would then be equal to 6000 calories. People are concerned with Calories because if a person consumes more dietary calories than they need or can use up, then they can end up gaining more weight. Different forms of exercise use different amounts of dietary calories so people may diet and start an exercise program to help lose weight. There are recommendations as to how many Calories a person should consume per day. An athlete would need to consume more Calories than a person living a more sedentary life. A calorie (cal) is the total amount of energy that is required in order to raise the temperature of one gram of water by 1 degree Celsius at one atmosphere pressure. The amount of energy needed to raise the temperature of water is also referred to as the specific heat of water. The calorie was defined as a way to measure energy by means of heat. It takes 1000 calories to make 1 kilocalorie thus to determine kilocalories you would divide by 1000. For example 5500 calories would be equal to 5.5 kilocalories. After 1924 the calorie was viewed more often in terms of joules, which is considered the unit of energy in the SI system. In terms of energy, the metric equivalent of calorie is the joule. Thus 1 calorie is equal to approximately 4.184 joules, symbol J. Calorie is thus a way to measure energy. 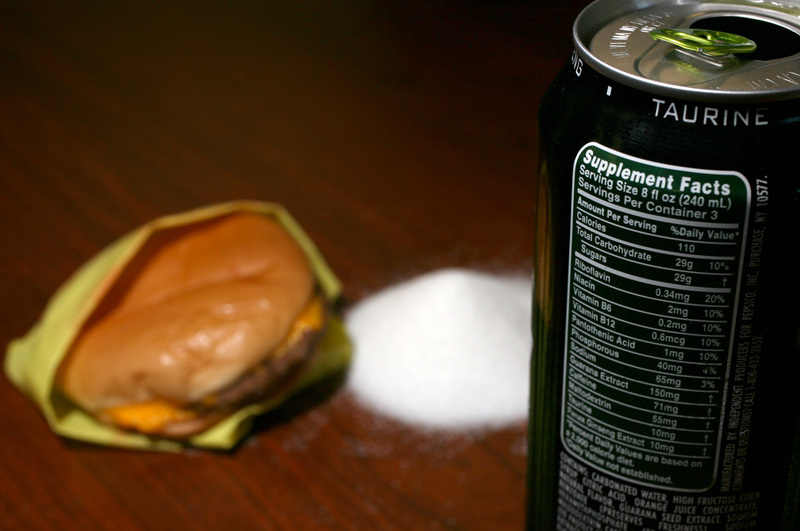 Although we see calories mentioned on food packages, these actually refer to kilocalories. Remember when looking at food calories, that since there are 1000 calories in 1 kilocalorie then you can easily convert between the two, so if a food item has 400 kilocalories this means it actually contains 400 000 calories since you multiply 400 by 1000. 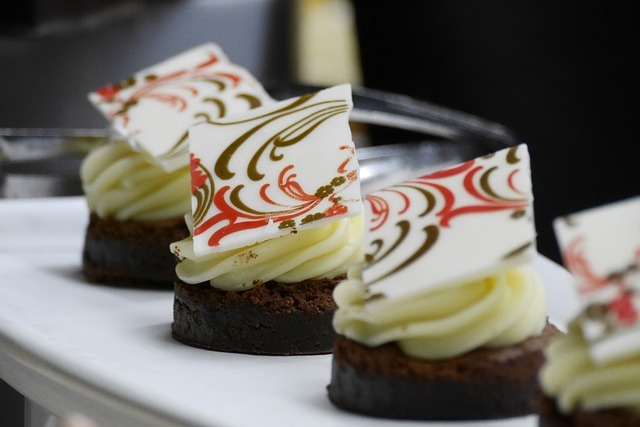 Calories are often used in calculations in physics or chemistry. The calorie however is not used when discussing human nutrition and metabolism because it is a very small unit. This means that it is not very useful when used on food labels or when calculating a person’s basal metabolic rate. A kcal or kilocalorie is 1000 times larger than a calorie. Thus 1 kcal = 1000 calories. Kilocalorie is the energy that is needed to increase the temperature of 1 kg of water by 1oC while calorie is the energy that is needed to increase the temperature of 1 g of water by 1oC at one atmosphere. The kilocalorie is also called the food or dietary calorie and is represented as Calorie while the traditional calorie is not usually used as a food or dietary calorie. Food labels in some countries actually use kcal even though it is called a Calorie. The calorie is not the same as the Calorie. The metric equivalent of the calorie is the joule (4.184) while for the kilocalorie the metric equivalent is the kilojoule (also 4.184). Kilocalorie and calorie are both used as measures of energy however kilocalorie is used far more often. A kilocalorie can be converted to calorie by multiplying by 1000 since there are 1000 calories in 1 kilocalorie. Kilocalorie is used on food labels and when determining basal metabolic rate. It is referred to as a Calorie in these cases, with an uppercase C to differentiate it from the calorie. The calorie is not useful for human diet and metabolic calculations because it is such a small unit of energy. The metric equivalent of calorie is the joule, yet many chemistry labs still use the calorie or kilocalorie when calculating energy during reactions. Dr. Rae Osborn. 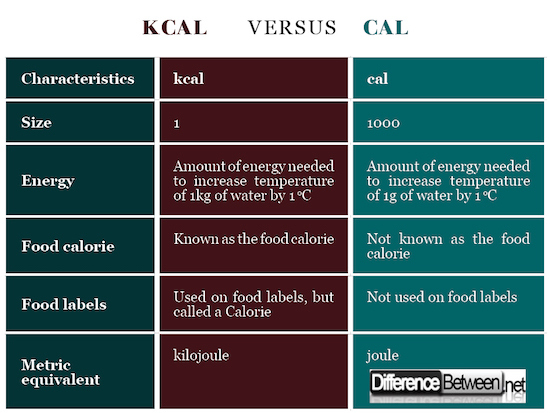 "Difference Between kcal and cal." DifferenceBetween.net. March 26, 2018 < http://www.differencebetween.net/science/health/difference-between-kcal-and-cal/ >.